There’s Beajolais Nouveau, the churn & burn cash flow gear devoured chilled & fast. Then there’s real Beaujolais, serious gear, the Cru’s, filled with personality and fun! When most wine drinkers first experience Beaujolais, it’s usually in the form of Beaujolais Nouveau, a fun fresh wine, typically the first wine to be released from France each year. Kind of like lower level Hunter Semillon. It’s not very serious, but, great to hoover slightly chilled on a hot day. Then there are the more serious wines. Both styles are made from Gamay, yet, from fun and fresh you go to wines every bit as intriguing as good Burgundy. They’re not directly comparable, yet, there can be similar traits. The first serious Beaujolais I had was near 40 years old when I drank it whilst studying winemaking. It was a revelation. Of late, the wines of two producers, have been popping up consistently as a pleasure to devour, those of Thivin and Daniel Bouland, oh and Foillard. Today we offer the 2016’s from Bouland + a special shipment of the 2015 Côte de Brouilly ‘Cuvée Mélanie’ named for his daughter. It’s fascinating to see the wines together and just how much difference a year makes to the harmony of the wine comparing the 2015 to the 2016’s. It’s a great insight into the progression of good Beaujolais. Bouland’s will surely be better with 3-5 years of age, but will undoubtedly last much longer. 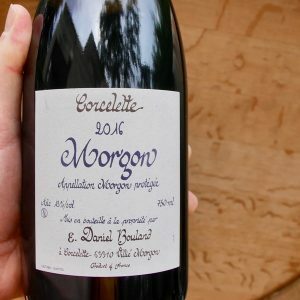 My tips, go longer on the2015 Côte de Brouilly ‘Cuvée Mélanie’ and 2016 Daniel Bouland Morgon ‘Corcelette’. Daniel Bouland makes some of the most old school and expressive wines in the whole of Beaujolais. Hand harvested from very old, organically-tended Gamay vines in the Morgon lieux-dits of Douby, Côte de Py and Delys, the Bouland wines are defiantly deep, dark, country-style reds with plenty of grip and overflowing with personality. These are wines that are built for the long hall, unlike so many of the region’s wines. Daniel himself recommends five years in bottle for the terroir to show the wine’s true sense of clarity and mineral nuance. From the best years, 15 years will not weary the Morgon cuvées. This is not to say they cannot be approachable as youngsters. Bouland portrays the artisanal Beaujolais vigneron in perhaps its purest form. He works alone in his vineyards where most of the material is gnarled, old goblet vines. His young parcels have been planted with selections massal from his older vineyards. Nothing is sweetened and nothing is taken away from the raw, visceral goodness of the juice. Hand-harvesting, very low yields, old wood, wild yeast fermentations, 100% whole bunch (open) ferments and non filtration, places him very much in the back-to-basics-dirt-under-the-fingernails camp. What we are left with is a serious glass of honest, handmade refreshment from a unique and respectful grower. There are 3 classification in Beaujolais. Beaujolais – Generic Beaujolais. much of this goes into Beaujolais Nouveau. Beaujolais Village – The mid-Tier split between a portion of Beaujolais Nouveau and more serious wine released the following year. Beaujolais Cru – The best gear we like to play with. There are 10 Cru’s. 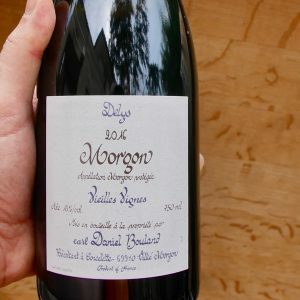 Daniel Bouland’s vineyards are in the Cru’s of Côte des Brouilly, Morgon, and, Chiroubles. We’re extremely grateful that Daniel Bouland cannot add ‘clairvoyant’ to his list of talents. When we met Bouland at the cellars in 2016, a devastating bout of hail and frost had smashed his vines and a naturally downcast Bouland told us that the Domaine was expecting to reap a paltry 5-6 hl/ha of juice from his eight hectares of vines. This would have likely meant no allocation for Australia. Fortuitously, the hail and the frost had struck in April and May, before flowering, and the vines somehow bounced back to ‘bless’ the Domaine with some 25 hl/ha (in an ideal year his yields would sit songs 45 hl/ht). So finally we do have some wine to offer this year. Perhaps not enough to crack open the Egly-Ouriet, but some wine nevertheless! In spite of these low yields, Bouland’s 2016s are not concentrated fruit bombs. On the contrary, the season encouraged Bouland to literally tread lightly, in so far as the extraction went, and so what has resulted is a set of mouth-watering, pure and precise Beaujolais of terrific perfume, supple freshness and vibrancy. These are wines that, in Bouland’s words, are “très gourmand”. Gourmand is another of those French words that is difficult to translate, but what Bouland means is that they are seductive and delicious now. Hedonistic even. They are not the heroic 2015s, but they are every bit as delicious. Following a hyped vintage is never easy, yet Bouland’s 2016s make it look relatively easy. All Bouland’s wines undergo natural yeast, 100% whole bunch fermentation, before ageing in large, neutral oak, and are bottled without fining and only a light filtration. The process that most impacts the style of wine made is the 100% whole bunch fermentation. Also known as carbonic maceration. Whole clusters of grapes are placed in a fermenter with the weight of the grapes crushing those at the bottom releasing juices that start to ferment producing carbon dioxide that protects the grapes from going volatile. Over time each grape begins to ferment indiviudally, creating complexity. The extraction of tannin is typically very gently. The techniques applied by the maker to manage the whole bunches during fermentation impacting the levels of extraction. The longer the wine is left before pressing to separate the liquids from the skins and stalks the greater the extraction, the more the work the ferment by pumping over the liquids or any other techniques the greater the extraction. The aromas of whole bunch wines tend to be quite perfumed and elegant. The terroirs of each of the wines having an impact. 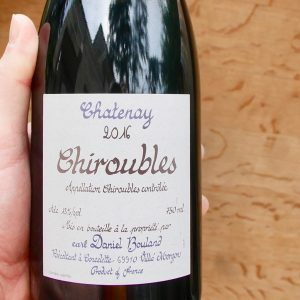 As a generalisation, of Daniel’s wines the Chiroubles tend to be the lightest, followed by the Côte de Brouilly in the middle, with the Morgon’s the fullest bodied. Named after his daughter, Cuvée Mélanie is drawn from just half a hectare on the slopes of the Mont Brouilly. Bouland’s steep parcel of 70 year old vines are rooted on Mont Brouilly’s famous terres bleu – blue tinted, volcanic soils – which lends the wines of this cru their unique mineral profile. The parcel is planted at 12,000 vines per hectare and, as with all of Bouland’s cuvées, this is a wine born from very low yields that is then whole bunch fermented with wild yeast and aged in old oak foudres. The 2015 is absolutely singing after an extra year in the bottle. It’s a deep, textured expression of this great mountain cru, with a core of tightly wound, blackberry and an iodine noted palate shot through with smoky minerals and tempered by vibrant acidity and spicy tannins. Deep, spicy and super impressive. Amazing the difference a year makes. 'Cuvée Mélanie' has settled, pulling together & showing harmony and elegance. There an extra layer of depth and degree of length from the full 2015 vintage. Such a pretty wine, flowers, spice, and darker fruits than the Chiroubles from 2016. The raw edges of youth have gone and left a lovely supply texture with a hint of bitter stalk that work beautifully with the wine to finish. Perched in between Morgon and Fleurie, the vineyards of Chiroubles are the highest in Beaujolais at around 400 metres above sea level. The vines sit on the upper slopes and in general terms produce a Beaujolais that can be, to quote Gerald Asher, all “…lacy texture and sleek charm.” Bouland’s Chiroubles comes from a 0.65 hectare parcel of 35 to 45 year old vines on the steep, ridged incline of Chatenay, on the typical granite and sandstone soils of the cru. Protected by a nearby forest, it’s a warm, north facing site and the 2016 is a lovely supple, open wine that’s packed with juicy cherry, rose and cool resinous notes. Delicious drinking now! Vibrant & fresh with a hint of spice & stalk, juicy acid marries a supple texture, delicious, fresh red fruits and a hint of musk. 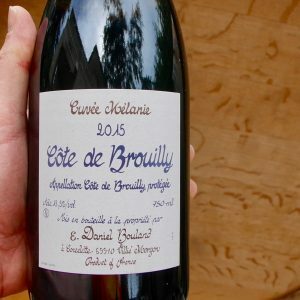 This particular wine is the first of the Bouland cuvées focusing on Corcelette’s pure, sandy, granitic soils, which gives wines of great perfume and finer, rounder tannins than those of Corcelette’s schist influenced terroirs. Although the name does not say so, this is truly a Vieilles Vignes cuvée. It has always been a 50-60 year old vineyard that has supplied the bulk of the fruit, as it is for this wine, and there are now two additional parcels of 80-year old bush vines. Partly aged in tank and partly in 2,000 litre foudre, it’s a really pretty version of the wine in 2016 with bright redcurrant, grenadine and lavender notes. Only medium-bodied it is perfectly balanced with a vibrant, lingering and perfumed close. It will age for a few years, no problem, but it is hard to justify waiting – it’s drinking so well now! Shifting to the Cru of Morgon, the masculinity, earthiness & fuller bodied nature of the Terroir shines through. An extra layer of complexity shines through on the nose. There's a lovely core of fruit that lingers, those hints of spice and stalk adding an extra dimmension. This wine used to come to us simply as ‘Morgon Vieilles Vignes’, but did not carry the name of the vineyard or lieu-dit. It now does. As always, this is Bouland’s most structured and age worthy wine and it comes from a single hectare of 90 year old vines located on the Morgon-Chiroubles border, at the end of the Corcelette valley. Planted in 1926 on a south-east facing slope at 10,000 vines per hectare by Bouland’s grandfather, this incredibly steep terroir was historically known as Delys, though on the map it is now listed as Bois de Lys. With a bit of squinting you can see the hill from the Bouland homestead. The soils here are very poor, pure granitic sand. The 2016 has a darker, more structured profile as always but it is certainly a much more approachable version of this wine. In fact it is a very good drink today – especially from a decanter and with some barbequed meats. Expect lovely dark cherry, blackcurrant and bramble notes shot through with smoky, pitchstone-like minerality that will progressively become meaty with age. Like all the Bouland wines there is wonderful purity, precision and clarity that is rare in Beaujolais (well it’s rare anywhere truth be known). It will be lovely in five years and should live a lot longer but again, it’s superb drinking now. With same earthy Morgon hallmarks as the 'Corcelette', the 'Delys' shows plenty of interest. It falls short on weight compared to the 'Corcelette' which I personally favour.